In relying upon recorded historical information to piece together the jigsaw puzzle of this lost Castle, this account will commence from a time predating the actual construction of the Castle - with the invasion of Britain by William the Conqueror. The Conquest of Britain by William radically changed the country in many ways – but perhaps one of the most significant was his introduction of efficient administration systems which involved recording and auditing his newly conquered realm. It is from this action that the Domesday Book came about. Of course Weddington as a place existed before this activity, but it is with the Domesday Book of 1086 AD that it emerges into the realm of recorded history and therefore this seems an apt point at which to begin this account. Indeed the area that was to become Weddington was very much alive with activity before the Domesday Book recordings. A pre-Roman, probably Iron Age, camp has been found at Oldbury on a high defensive position above the Anker Valley, formed by a hard rock outcrop that itself contains rare fossils. The Romans also left their mark on the area - a Roman fort was found in 1980 at nearby Coleshill, whilst Mancetter (or Manduessedum) has long been known as the site of another significant and large Roman fort. Some archaeologists think that it was the home of the fourteenth Roman Legion and that Queen Boadicea (Boudicca) met her fate outside the fort in the Anker Valley. Closer to home the finding of a Bronze Age flat axe in a field to the north east of St James' Church in Weddington, suggests activity in the area at this time. A more detailed account of the pre-Domesday history of the area can be found in the Timelines section. "The count [Meulan] himself holds 3 hides [1 hide = roughly 120 acres] in WEDDINGTON and Hereward [holds] of him. The same man held them TRE [rightful ownership] and was free. There is land for 7 ploughs*. In demesne are 1 ½ [ploughs], and 4 slaves; and 12 villans [landed peasants] and 5 bordars with 4 ploughs. There are 20 acres of meadow, [and] woodland 2 furlongs long and 1 furlong broad. It is worth 30 shillings." * at the time of the Domesday a plough implied a plough team with 8 oxen and the plough itself. Whilst we might imagine Watitune at this time to be a village as we tend to know them today - compact, centred around a church and separated by open land - it was most likely not. Instead, habitations in most areas of late 11th century England followed a very ancient pattern of isolated farms, hamlets and tiny villages interspersed with fields and scattered over most of the cultivable land. At the time of the conquest the land upon which Watitune lay was owned by the Saxon Hereward the Wake. Whilst William gave the manor of Weddington (among several others) to one of his noblemen, Count Meulan after the conquest, it appears that Hereward retained possession this land by becoming an under-tenant of Count Meulan’s. This would have rankled with Hereward not just because of his dispossession, but for the reason that under-tenancy incurred a debt of military duty to his new Norman lord. This arrangement reflected the same pattern of most counties after the conquest, with various lands being distributed amongst different heroes of the Battle of Hastings, whilst the King retained direct control of most of the strategically important holdings and wealthy lands. It is little surprise, perhaps, that Hereward went on to join the resistance against the Norman invasion - writing himself a place in English folklore in the process. Count Meulan (otherwise known as Roger de Beaumont) was one of William's most favoured benefactors as well as being the most powerful seignior in Normandy. Sometimes the records in England show him as Robert, although this may be caused by a confusion between his son, Robert, and Roger who actually held the lands. Roger adopted the title Count of Meulan from Adelina, his wife's family. 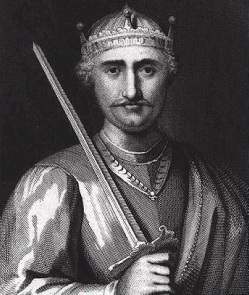 Henry de Beaumont, his younger brother, later succeeded Count Meulan to the Earldom of Warwick, although the land of Weddington was subsequently granted to Philip Astley by Henry I in 1100. By this time Weddington was still a modest village, with the notion of the Castle yet to be considered.